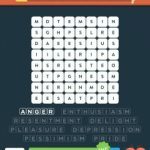 Stuck in Wordbrain 2 Emotions & Feelings (Word Overlord 8×8). Here are the answers. I cannot see the anwsers. I cannot see the answers to emotions and feelings in the word over Lord of wordbrain2.